Welsh Tory leader has his knuckles rapped? Wednesday saw all meetings in the Senedd cancelled due to strike action by some staff. The Tories were naturally perturbed by this and took to YouTube to protest that this would never happen in Scotland, Northern Ireland or Westminster. 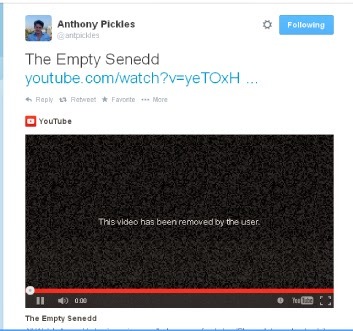 The tweet advertising the video is still there but the video itself has been taken down.